The tragedy the Kosi unleashed in Bihar is not only moving hearts but also making brains tick. From toilets made by using bamboo to software for tracking missing relatives, government officials are getting innovative in helping people pick up the pieces. Officers claim that a bamboo revolution is on the cards. Now that floodwaters are receding, H C Sirohi, commissioner of Saharsa division and in charge of flood relief operations, has launched a training programme to make bamboo furniture. "At first all we saw were resigned faces of thousands of flood victims grieving the death of their dear ones. We then decided to use local resources to help them rebuild their lives. Bamboo seemed the obvious answer as it grows here in plenty and we believe it will usher in employment opportunities," Sirohi said. 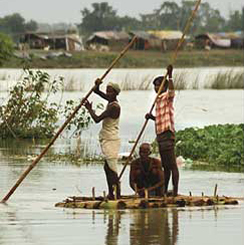 The Bihar government has finalized a blueprint to create a bamboo economy in the flood-hit northern and central Bihar. Talks with the National Bamboo Mission have begun for setting up women's self-help groups. National Bamboo Mission is a government body created by the Union Ministry of Agriculture to promote the bamboo sector. The government has assured flood victims that it would purchase their bamboo furniture for schools and government offices, replacing wooden benches. It also plans to sell the furniture in other states. 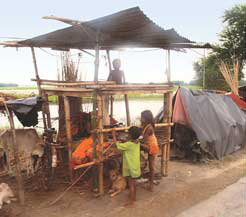 Bamboo furniture made by over 200 flood victims is being used on trial basis in relief camps. 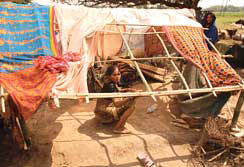 People are encouraged to use beds and makeshift shelves made of bamboo. This, Sirohi said, was more hygienic than sleeping on the floor. "We have also designed toilets whose walls and roofs are made of bamboo," he said, adding that such toilets are cheap. After the evacuation and relief operations, tracking missing people was the government's priority. Initially, it used software developed by ibm for tracking the missing people. The ibm software was successfully used in Sri Lanka after the 2004 tsunami. "However, since it worked by using passport or driving licence number, it failed in Bihar because here people did not have such documents," said Arvind Choudhary, project director of Jeevika, a state government body working for rural development. This spurred Jeevika to develop a software with the help of it majors. This one is based on data such as the name of the missing person, his village, block and district. Called the Missing Person Tracking System (mpts), this software is being used to track down lost relatives. "Data collected by Jeevika and the officials from flood-hit districts is entered into the software. We have ensured that names of the district, block and village are automatically corrected even if wrong spellings are keyed. Over a dozen families have been re-united with their missing members," added Choudhary. The State Disaster Management Cell in Patna also deployed six teams of "mobile inspectors", who tour relief camps in flood-hit regions incognito and take photographs of the conditions in those camps. The mobile inspectors are given gprs- enabled cell phones fitted with cameras. When an inspector clicks the picture of a person or a place, the location, time and date also get recorded. These pictures are then sent through mms or sms to the State Disaster Management Cell. "This has been instrumental in alerting us about shortcomings in relief camps," said Amrit Pratyaya, additional commissioner, State Disaster Management Cell. The most moving invention, however, came from the flood victims themselves. Marooned people used makeshift boats made of six pieces of thick banana stems tied together and kept afloat using locally grown patua fibre. Such boats were widely used in almost all of the flood-hit areas. Such boats, although unsuitable in strong currents, can remain viable for sometime because the banana trunks expand a bit by imbibing water, tightening the joints held together by the rope. Army and navy officials helping with relief work said a their possible use should be studied.